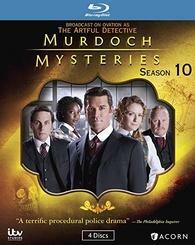 Smart and engaging, this award-winning Canadian series returns as Detective William Murdoch (Yannick Bisson, Sue Thomas: F.B.Eye) and his friends solve new mysteries in Edwardian-era Toronto. In Season 10, Dr. Julia Ogden (Gemini winner Hélène Joy, Durham County) deals with post-traumatic stress from her near-death experience last season; Constable Crabtree (Jonny Harris, Hatching, Matching & Dispatching) has a new sweetheart; Inspector Brackenreid (Thomas Craig, Where the Heart Is) gets caught up with soccer; and lab attendant (Mouna Traoré, Carrie) continues her medical education. Murdoch and his team face murdered debutants and philandering businessmen amid historical events like the Great Toronto Fire of 1904, old enemies come back to haunt them.